How your doctor treats your kidney stones or stops new ones from forming depends on what type of stone you have. Calcium stones (80% of stones) are the most common kidney stones and can be either calcium oxalate or phosphate. Calcium oxalate is by far the most common type of calcium stone. They precipitate if you have too much calcium in your urine but even with normal amounts of calcium in the urine, they may form for other reasons. Eating junk food can make you prone to hard calcium oxalate stones (hard to hammer), and so can unhealthy foods like biscuits, cookies, bread (contains yeast), rusks, deep fried, roasted, baked, fridge items like chilled water, soft drinks or ice creams. 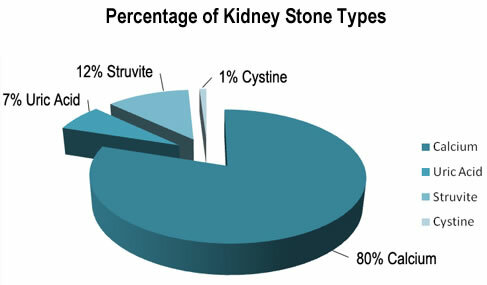 Struvite/infection stones (12% of stones) are magnesium ammonium phosphate stones that form in alkaline urine. They are relatively uncommon and precipitate when someone suffers from chronic urinary tract infections (UTIs). Infection causing bacteria can lower the acidity of urine and make it more basic or alkaline. These stones are often large, with branches, and they grow very fast. People who get chronic UTIs could be the ones with long-term tubes in their kidneys or bladders, or people with poor bladder emptying due to neurological disorders (paralysis, multiple sclerosis, and spina bifida) are at the highest risk for developing these stones. Cystine is an amino acid present in certain foods and is one of the building blocks of protein. Cystinuria (too much cystine in the urine) is a rare, inherited metabolic disorder. It is when the kidneys do not reabsorb cystine from the urine and high amounts of cystine are in the urine, it causes stones to form. Cystine stones often start to form in childhood.